The following list summarizes and introduces Egypt's banking sector and presents the top banks in Egypt. These top banks include institutions such as the National Bank of Egypt (NBE), Banque Misr, Banque du Caire or the Commercial International Bank (CIB). Egypt's banking market is dominated by three very strong local banks the National Bank of Egypt (NBE), Banque Misr and Banque du Caire. They altogether represent 70% of the market in terms of the total assets and total profitability. The private sphere of Egypt's banking industry is topped by the the Commercial International Bank (CIB), which is the main private bank in Egypt also listed on the EGX. CIB is followed by QNB Alahli, which took over the National Société Générale Bank. The third largest private bank in Egypt is AlexBank. According to a report issued by the Information and Decision Support Center (IDSC), deposits in Egyptian banks grew by 20.2% in July 2014 compared to the same period in 2013, reaching EGP 1,456.9bn in July 2014 compared to EGP 1,212bn for the same period in 2013. Balances of credit facilities, whether governmental or non-governmental, increased by 6.8% in July 2014 compared to July 2013. The increase in private sector borrowing is expected to continue to follow this trend with a growth of 5-10%. The National Bank of Egypt is the oldest commercial lender established in 1898 with a starting capital of EGP 1m. Today, the NBE is the largest commercial bank in the sector, claiming a market share of 23.4% of total assets, 26.3% of total banking system deposits and 21% of total banking system loans as of June 2013. Since its establishment in 1920, Banque Misr has mainly focused on establishing companies in various fields and sectors. Bankque Misr has been awarded "Best provider of money market funds in the Middle East" for the year 2012, 2013, 2014. As of June 2013, the bank’s market share of lending is 9% and it maintains 15.9% of total banking system deposits. 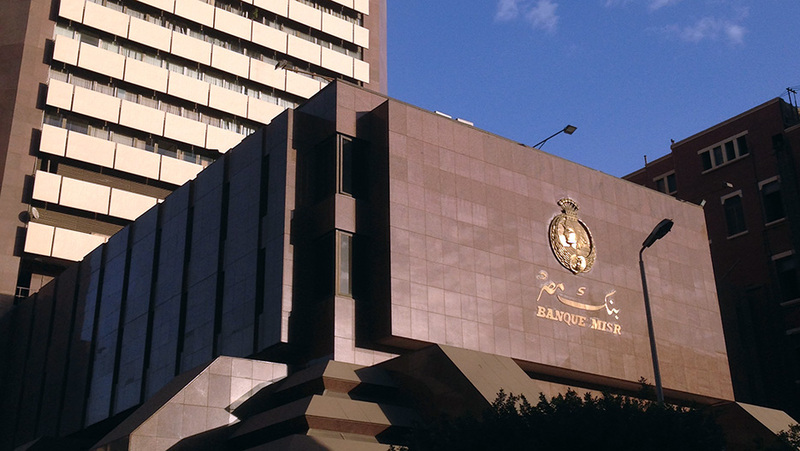 Founded in 1952, Banque du Caire ranks third on the list of the top banks in Egypt; amongst banks operating on the national scale. Commercial International Bank was established in 1975 as a joint venture between the National Bank of Egypt (51%) and the Chase Manhattan Bank (49%). In 1987, the NBEincreased its stake to 99.9%. In 2014, CIB was awarded the “Best Trade Finance Bank in Egypt” as well as the “Best Investment Bank”. As of June 2013, CIB’s market share of total banking system deposits was 7.6%. In addition, CIB maintained the highest loan market share of all private-sector banks—at 8.27%. National Société Générale Bank (NSGB-Egypt) is the second-largest publicly-traded bank in Egypt. In March 2013, the Qatar National Bank (QNB) acquired 100% of the 443,535,902 shares of the NSGB. The bank’s market share of total deposits is valued at 5.18% while total loans add up to 7.64%. AlexBank (or Bank of Alexandria) was established in 1957 as an Egyptian joint stock company. It was privatized in October 2006 via selling 80% of its shares to the Italian banking group Intesa Sanpaolo. Today, AlexBank has a market share of almost 7%. It is the third largest bank in the private spere of the Egyptian banking sector. HSBC has had a presence in the Middle East since 1959 and has been in Egypt since 1982. The Bank is a subsidiary of parent HSBC Holdings London, which owns 94.53% of ordinary share, the remaining percentage (5.47%) is owned by other shareholders. HSBC Bank Egypt’s market share increased from 2% in 2012 to 3.1% in 2013. Crédit Agricole Egypt (CAE) is a subsidiary of the Crédit Agricole Group, a market leader in Universal Customer-Focused Banking in France and one of the largest banks worldwide. In the secondary market, CAE ranked first, with a sales market share reaching 30.43%. Arab African International Bank was established by Special Law as a Joint Venture between the Central Bank of Egypt (CBE) and Kuwait Investment Authority (KIA), and was incorporated in 1964 as Egypt's first Arab multinational bank. AAIB’s market share reached 1.4% in 2013. Faisal Islamic Bank of Egypt is the first Egyptian Islamic & Commercial Bank. The bank has officially started operations in July 1979. Faisal Islamic Bank of Egypt's total assets reached more than 6.5$ billion by the end of 2013. Established in 1961, the Central Bank of Egypt (CBE) has the monetary authority over the banking sector in Egypt.